Free Wi-Fi and breakfast a sauna and a convenient downtown location next to the convention center make the grade with our guests at the non-smoking Hyatt Place San Jose. The nine-floor Hyatt Place has 239 non-smoking rooms all with premium cable TV free Wi-Fi coffeemakers desks mini-fridges and comfy signature beds with thick mattresses. Take some time to relax in the sauna after a workout in the fitness room or a stint in the business center. Enjoy a free breakfast each morning and pick up a bite anytime in the 24-hour market or from around-the-clock room service. The hotel also has fitness and business facilities and a gift shop. Pets are welcome and parking is available both for an extra charge. 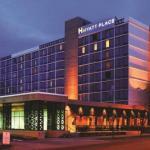 The Hyatt Place is in downtown San Jose adjacent to the light rail station and San Jose McEnery Convention Center and a short stroll to the Tech Museum and Children's Discovery Museum. The SAP Center is one mile northwest and Winchester Mystery House is four miles west. If you're driving from Norman Y. Mineta International Airport the hotel is four miles southeast.